That's me. I was born and grew up in Garmisch-Partenkirchen. This beautiful Bavarian village is located at the northern border of the Alps and so I learned skiing before I knew school. Skiing is still one of my favored sports, besides windsurfing, which was not even invented when I was born. After finishing high school (in Germany, it's called Gymnasium) and spending a year in the German army, I studied physics at the Technical University Munich and the Karl-Franzens Universität Graz. During this time, I also worked at the Fraunhofer Institute for Atmospheric Environmental Research. It was conveniently located in Garmisch-Partenkirchen, which allowed me to go skiing during lunch time. In 1998, I moved to San Diego. You can find out more about my current work here. my parent's house in Garmisch-Partenkirchen. Here I've spent the first part of my life. Garmisch-Partenkirchen is the center of the Werdenfelser Land and the mountains surrounding the village offer great hiking during summer and awesome skiing during winter. Germany's highest mountain, the Zugspitze is just minutes away from downtown. There are worldcup races in downhill, super-G and slalom every year. Once the village was even hosted the Winter Olympics. Apart from steep mountains, Garmisch-Partenkirchen offers beautiful lakes, gorgeous old churches and original Bavarian culture. Just browse the Updater and look for pictures of this wonderful place! The real Neuschwanstein castle (not the one from Disneyland) photographed from a small plane, which a friend of mine was flying. Garmisch-Partenkirchen is also in the center of the famous castles of King Ludwig II, including the most noted Neuschwanstein. 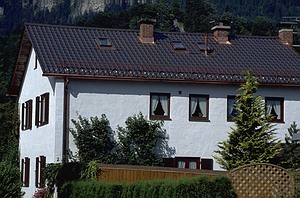 It is only 20 miles away from Oberammergau, which accommodates the famous passion play. Many internationally known artists have spent a great part of their lives in Garmisch-Partenkirchen or in its vicinity. Amongst them is the composer Richard Strauss, who lived there for 40 years. The Richard Strauss Festival, which takes place every year in Garmisch-Partenkirchen, has now become an important date in the European music calendar. Many of the internationally known expressionists like Wassily Kandinsky, Franz Marc, Gabriele Münter, and August Macke, which founded the famous artist association Der Blaue Reiter, lived in the Werdenfelser Land and got inspired by the scenic landscape. Because of all these treasures, tourists from all over the world come to see this blend of pristine nature and original culture. Many U.S. citizens who served in the army know Garmisch-Partenkirchen since one of the European American Force Recreation Centers is located here. Check out the official websites of this jewel in the Bavarian Alps and share my joy when looking at the picture below, which I took from the balcony of my parent's house. View from my balcony at home towards the Wetterstein-Gebirge. Slide slowly with your mouse over the summits to see their names and some story behind!